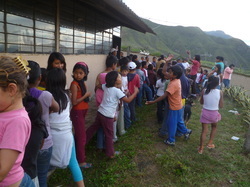 Children lined the walls outside and peaked through the windows of the school. The excitement of the art classes had spread through the village and the president of the village helped to organize lines and keep the peace as we brought in 10 excited children at a time. I was also lucky to have the help of Sonya, a local of that village that works very hard in providing the best for the elders. We worked with Entre las Estrellas to provide art lessons and kits to children in rural areas, at schools and throughout their villages. We will also be providing quilts through Threading Hope throughout the village. Among the Stars (Entre las Estrellas) is located in the Chota valley north of Quito, a dusty small town where poverty rules. Paragachi, Ecuador! The children were asked to draw pictures of things that make them happy. Many drew their family and trees. Some even drew Christmas trees, the smiles and joy that a piece of paper and crayons can bring is such a beautiful thing. I want to give a special thank you to Frank Gattie for your collection and crayon donations from New York restaurants... the joy that children get from coloring with the crayons you collected! Thank you.